Looking for a USED GD16C2? 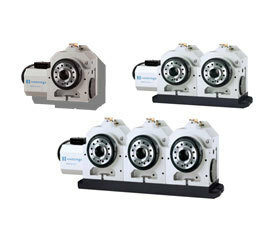 Hardinge 16C and 3J Rotary Tables are available in single, dual and triple spindle configurations. The A2-5 16C or 3J spindle will accept collets, expanding collets, step chucks, jaw chucks and slotted face plates without the use of an adapter! The robust dual-bearing spindle provides support for heavier radial and axial loads with indexing speeds of up to 300-degrees per second. The motor can be mounted on the left or the right side of the spindle. The standard Pneumatic collet closer provides 3987-pounds (1808kgs) of draw bar pull at 100 psi of supplied air pressure. The Hardinge 4th axis rotaries are available for the Hardinge GX and XR Machines with Fanuc or Heidenhain controls and the GX1000 Machine with OSP control. These units are also available for other machine manufactures. Looking to Purchase a New HARDINGE GD16C2?